Are you in the mood for Asian food, particularly Vietnamese? These cuisines are inherently healthy. I love the idea of spring rolls but they are usually fried or wrapped in white rice paper at a restaurant. I made my own with brown rice paper from Whole Foods (in the Asian food aisle). 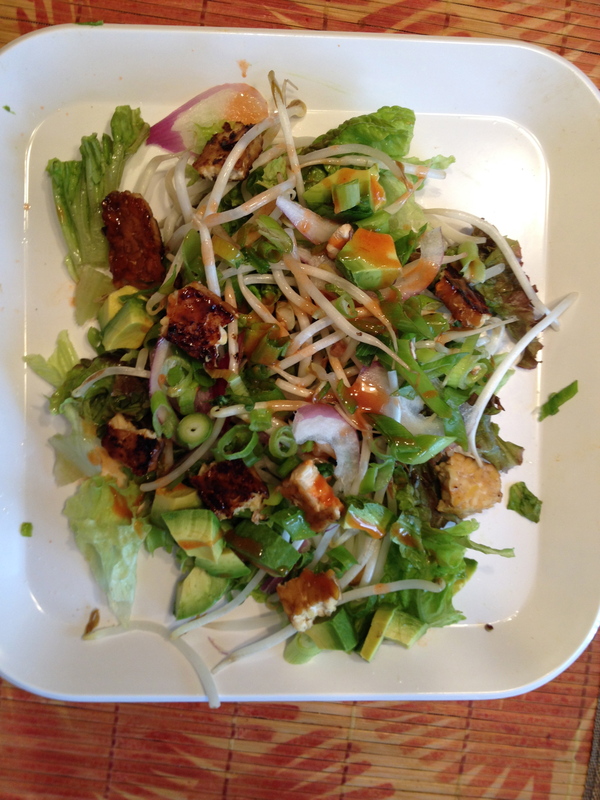 I got the idea from Kimberly Snyder CN but I switched up the ingredients a bit: brown rice paper wraps, organic red leaf lettuce, organic tempeh, sprouts, red onion, avocado, organic scallions, sea salt , hot sauce, organic shiitake mushrooms, organic Worcestershire sauce. You can put whatever you like in the wraps. Feel free to switch up the ingredients. Cut tempeh length-wise into eight strips. Saute strips in a mixture of water and Worcestershire sauce for about 3 minutes on each side. Add shiitake mushrooms to pan with tempeh and cover for last 3 mines of cooking. Slice onions and avocado and chop scallions finely. Dip each wrap in a bowl of war waterm to soften it. Lay wrap on a flat surface and place a small amount of lettuce, sprouts, onions, scallions and mushrooms in the center. Add one strip of tempeh and sprinkle hot sauce on everything. Gently roll the wrap burrito-style securing the edges if possible. If you overstuff the wrap it will be harder to fold and may tear. The wrap will stick easily once rolled. I made a simple salad with the left over ingredients. I still have to work on the aesthetics but they are really good and there’s no need for added oil.